Maya Gunaseharan spent her first year in college at American University, then transferred to Cornell. Now, both schools are asking her to donate money. "I had a really great first year at American," said Gunaseharan, who is 24. "But I've seen a very clear return as a result of my degree from Cornell. So I absolutely feel the tension about who to give to." Universities and colleges are feeling the pressure, too. Today, nearly a quarter of students who earn degrees finish somewhere other than where they started, according to the National Student Clearinghouse. And as more students jump from school to school, colleges say it's getting harder to solicit all-important alumni donations. "What motivates alumni to give is a sense of loyalty, an indebtedness that 'I am who I am because of my education,'" said Shaun Keister, vice chancellor for alumni relations at the University of California, Davis. "What we don't know from this generation that jumps around a lot is: Are they ever going to have that warm and fuzzy feeling for the campus?" 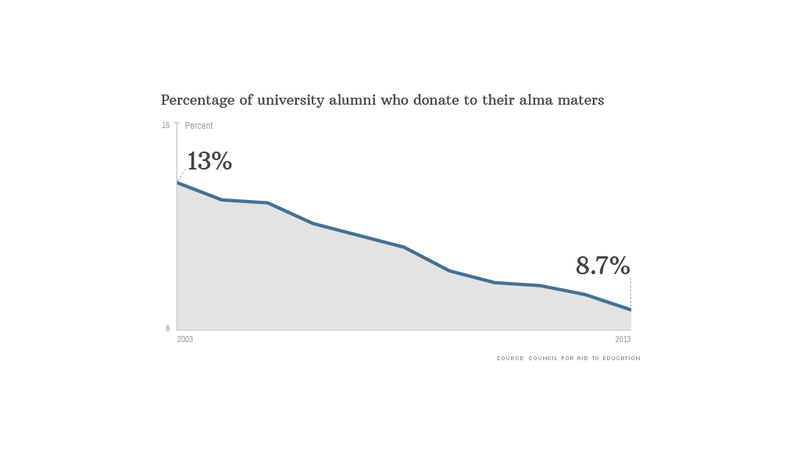 While total contributions to colleges and universities were up last year, the percentage of alumni who are actually giving is shrinking, according to the nonprofit Council for Aid to Education. 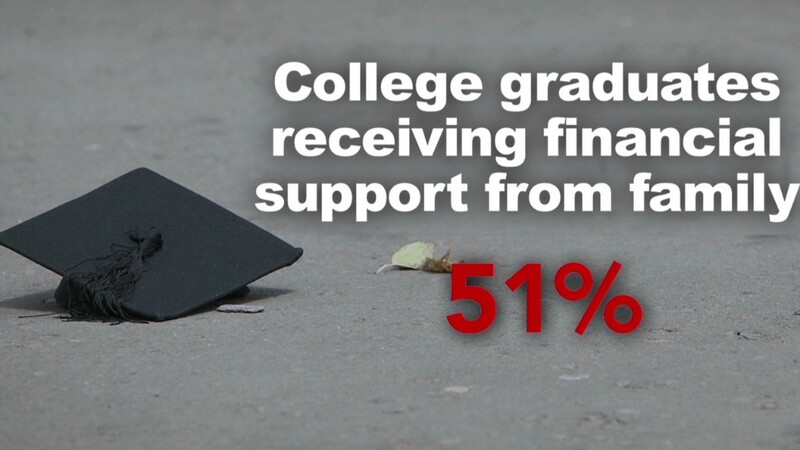 In 2003, 13% of alumni gave to their schools. Last year, just 9% did. And that's what's keeping alumni directors up at night. The participation rates keep falling "even though we have more sophisticated programs, bigger programs, more options" -- like social media -- to help encourage giving, said Brian Kish, senior vice president for central development at the University of Arizona Foundation. Alumni executives and consultants say the transfer phenomenon is partly to blame. "So let's say you went to three different places undergrad, and then to grad school — because we have more people going to grad school, too. Now you've been to four schools. Where's your love? Where's your affinity? Where's your passion?," asked Kish. Related: Are in-state students getting squeezed out of public universities? The problem isn't likely to affect elite universities and colleges, whose students almost always graduate on time, and rarely transfer, said Chris Marshall, vice president for alumni relations practice at the consulting firm Grenzebach Glier and Associates. But for mid- and lower-tier schools, where most of the transfers occur it's "going to be hard to engage if they don't have that four-year experience with some continuity," he said. And alumni who do give seem to support the universities or colleges from which they ultimately graduate. Another source of worry: Community colleges, where many students start their college careers these days, are also beginning to go after financial contributions from alumni. "It's one more organization coming after the same pool of people," Keister said. Yet, many university and college alumni offices have failed to reach out to students who transfer in from community colleges while they're still enrolled, as they often do with conventional freshmen. Now more schools are beginning to do this, beginning at the orientations they require transfer students to attend. "You have the undivided attention of students two times. Once during orientation and again at their graduation ceremony. Otherwise, good luck," said Keister. Gunaseharan, meanwhile, is mulling the requests for money she's received from Cornell and American — which has another pull on her because her mother went there — but she is putting them aside while she plans to go to graduate school. "I'm not really in a position to be giving loads to any of my alma maters," she said. "I'm still saving money for the next degree."